The objectives of this five-year Transportation Pooled Fund study are to evaluate conventional and new technologies and procedures for testing concrete and concrete materials to prevent material and construction problems that could lead to premature concrete pavement distress, and to develop a suite of tests that provides a comprehensive method of ensuring long-term pavement performance. A preliminary suite of tests to ensure long-term pavement performance has been developed. Shadow construction projects are being conducted to evaluate the preliminary suite of tests. 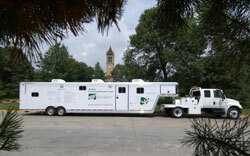 A mobile concrete testing laboratory has been designed and equipped to facilitate the shadow projects. The results of the project are being compiled in a user-friendly field manual, which will be available by summer 2006.